Guest Post on MBB #1 HERE. Never Say Never - Line, fill, then top with gloss — or don’t. This lilac rose Velvet Matte Lip Pencil delivers a look you’ll never say no to, however you choose to wear it. I have always wondered about how companies come up with product names. What was on the person's mind when he/she came up with Never Say Never - all I could think of was Justin Bieber :P When I saw the brightly colored pencil, I knew just why they named the NARS Velvet Matte Lip Pencil from theNARS Summer 2012 Makeup Collection so. This is a color I would "never" have picked some time back, and I would "never" have posted a photo online for the world (or at least a tiny part of it) to see. So, now I know the theory behind the name! The NARS Never Say Never is a chubby lip pencil and a bright mauve-pink color with a matte finish. It features a long-lasting, nondrying formula that somehow combines a matte finish with a creamy texture. Until recently, I never would use brighter colors, always feeling that this would clash with my darker skin tone. As they say, Never Say Never! This somehow manages to warm up my skin tone and actually makes me look more awake and bright. It's not that we don't get oranges in India, but I have never seen an actual tree in all my life. The place I stay in now, though, has an orange tree nearby, and as fascinated as I am with actually seeing oranges on a tree, I am more fascinated by the flowers. I noticed them today as I was walking under the tree - these tiny white flowers just perfume the whole air, and it's nothing like the things they bottle and sell! Have you ever smelled these? A simple pencil case from Staples that works perfect to store my gel liners in. I don't have a huge makeup stash, so this is sufficient for me, and it's just the right size too. So, do you have any such fun ways to store makeup. The French word for “harvest” or “vintage” perfectly describes this sheer grape lipstick, as it conjures images of juicy, just-picked fruit off the vine. A beautifully sheer formula infused with ingredients to improve the condition of the lips. Sheer, long lasting color pigments have been suspended in this tranlucent formula to provide a sophisticated shine. This "sheer grape" lipstick looked so dark in the tube, I was a bit worried. Plus it looked brown. Dark and brown - not my favorite words when it comes to lip colour. Good thing I didn't try returning it before swatching :D NARS Vendanges is described as a sheer grape, but I would describe this as a plum-brown lipstick, and because it is kind of sheer, it doesn't show up too dark on my lips either. My lips are naturally quite pigmented and very unevenly so. Plus, they are prone to dryness and rarely if ever at their hydrated best :| Because of all that, my heart (and lips) lie firmly in the creamy lipstick camp while still wishing some of them would hang around beyond a 2-hour window. With NARS Vendanges Sheer Lipstick, I think I just found my new lipstick love. It provides a surprising amount of coverage for a sheer lipstick while still miraculously staying around for 3 to 4 hours, fading gradually with time. The texture is smooth, creamy, and quite comfortable. No problems with flakiness or dryness of the lips with this one. Here's how it looks on me. From the classy matte packaging to the sophisticated shine and colour, this lipstick is a definite winner. It has a slight fragrance to it (I can't really describe it, though I am quite tempted to say grapey :P) but nothing that would bother a sensitive nose. A definite must-have from the NARS Summer 2012 collection, especially if you are one of those who is on the lookout for a subtle wearable colour, and I am sure this would work with any skin tone. Part of the NARS Summer 2012 Makeup Collection, Calabria is a shimmering plum, chubby pencil that claims to be a happy marriage of a pencil and a cream shadow - the best of both worlds - packed in a portable pencil form. "Smooth, creamy, long-wearing formula," says NARS. It is a chubby pencil, and it is soft and creamy. Beyond that NARS Calabria seems to have a mind of it's own with no intentions of sticking to any guidelines that NARS might have put forth. A beautiful plum shade, I fell in love with it the moment I swatched it. Needless to say, the love affair didn't last very long - more on that in a bit - but here's the swatch. All that shimmer and no staying power, that's what Calabria's main problem is. I did get a little longer wear over a primer and smothered with an eye shadow, but that wasn't anything great - better than the hardly any time that it lasts when used on its own, though. The oddest thing about it, for some strange, strange reason, it stays on near my lashline. Guess the eyelashes provide it some sort of company and an incentive to stay on :P It fares better on my lower lashline than the upper, probably because it's a lot less oily. The only good thing about it - it doesn't leave racoony shimmery messes on my face on it's way out. Not my favorite, especially for the cost. 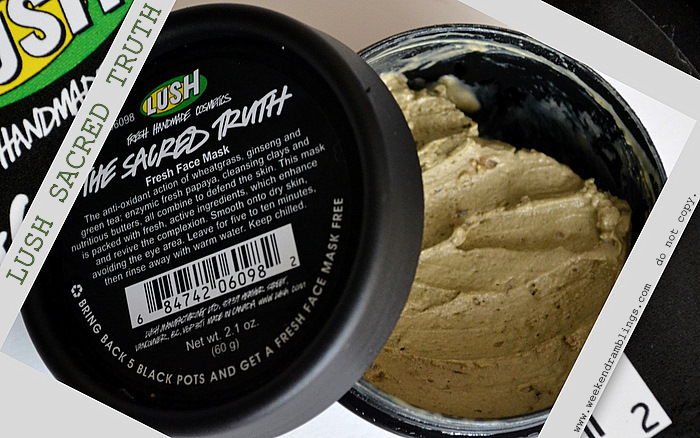 Lush Sacred Truth Face Mask - In here, we have ginseng and green tea for their antioxidant effects. Fresh wheatgrass for its natural superoxide dismutase (SOD) – which are free radical scavengers. Rich, softening ingredients like linseed, eggs, evening primrose oil, shea butter, lanolin, coconut oil and honey to be soothing and moisturising. Clays of kaolin and talc will help clean the skin and papaya will help dissolve dead skin cells. This is a serious, complex mask to give maximum benefits for those who know that a little extra help and care will keep their skin at the height of its game. Lush Fresh Face Masks are one of my favorite skincare products. Made with fresh, organic, natural ingredients - so fresh and preservative-free that they have to be stored in the fridge and used up in about 2 weeks - these are, in my opinion, the easiest way to pamper your skin. I have oily skin, so I generally stick to Cosmetic Warrior - a garlic and tea tree based mask that cleans up blemishes and oiliness - or Brazened Honey - perfect to brighten up dull skin. This time, though, I decided to try out the Sacred Truth Fresh Mask that promises a boost of antioxidant power. Unlike some of the other fresh face masks from Lush, this is quite evenly textured, smooth, and easy to apply. It has a pleasant smell, but with Lush, I do find minor variations between batches, and sometimes it tends to smell a tad too strong. For my oily-combination skin, I found this too rich a mask, leaving behind an oily film that did no favors for my already acne-prone skin. My mom, though, loves this mask - it's her favorite Lush mask - and I really do notice a difference in her skin whenever she uses this. Overall, I would recommend the Lush Sacred Truth fresh face mask to anyone who really does need antiaging/antioxidant care for their skin and better suited for the normal-dry skin types, at least in my opinion. Genie in a black tub, yes, - but use it only if you need it. I don't quite buy the theory that if you are over a certain age (and a rapidly decreasing number) you need to start using antiaging products. Sunsceens and good basic skincare, yes, but not every skin needs a dose of everything - especially if it's already oily. This does work great on drier/mature skins, though, and I suppose that is the market this it is aimed for. Remember to clean and save the little black tub - collect 5 and exchange at any Lush store for a fresh face mask of your choice. Other Lush Product Reviews (check here). Rimmel London Match Perfection Blush - perfectly coordinated blush shades with a hint of blue saphire for a naturally even flush. Use each shade individually or swirl and mix the two to create your own unique shade. I am generally quite the clumsy oaf, but I amn't responsible for that tiny chip on the side of that blush! Now that's clarified, on to the blush itself. The Rimmel Match Perfection blush is comes packaged in a flat round pan - quite large sized. The blush has two shades in it, packed with a pretty pattern embossed on the surface. Mix the two shades or use individually - the size is large enough that you can easily pick up the shades without mixing. The plastic top had cracked a bit when I got it, but the blush was mostly undamaged, so I am quite happy with the packaging. Another thing I like is the little lock feature so I can easily carry it around in the bag without worrying about it accidentally opening. The little dot goes into the groove and keeps the lid locked on. My initial reaction when I saw the colour was that it's never going to be seen on my skin. The shades included in this blush are a dusty rose and a paler peach rose - both the shades are almost matte but do have the tiniest hint of a shimmer. The shades are quite pigmented, smooth, and easy to blend. As for showing up on my skin, I really couldn't get it to show up in the photos as this shade gives me an almost invisible flush. While not the shade for me, for anyone with a lighter skin tone, this would be a beautiful blush that would give the most natural flush. I am adding in swatches just to give an idea about the colour (these are very heavily swatched to show up on my skin - actual product goes on quite light and subtle). Rimmel Match Perfection Blush Swatches (L to R): Darker colour, paler colour, and the two colours mixed. I don't know the cost of this right now - it's one of those rare occasions when Google failed me - but soon as I know, I will update it here! Bright, bold, perfectly matte, this super-rich lipstick provides high-impact payoff: an ultra-pigmented, long-wearing formula that glides on effortlessly with comfortable wear. Contains wild mango butter, known to provide advanced moisturizing properties to repair dryness and scaling and enriched with vitamin E and açai oil for antioxidant benefits. NARS Velvet Matte Lipstick Moscow: A strawberry red Pure Matte Lipstick is as striking and sophisticated as the Russian capital that lends its name. NARS Moscow is red with a hint of orange to it. For some reason, when I read strawberry red, I was imagining a pinkish red - guess I was thinking of strawberry smoothies :P It's a matte finish and a subdued red which makes it easy to wear on a bright summer day. I find it easier to apply it lightly and build up the colour as I want it rather than applying a thick, opaque layer right away. It tends to look more orange when it gets more opaque, so I prefer the sheerer application. So, what's your favorite red lipstick? When it comes to blush, how and where you apply it is more important than what color you use. 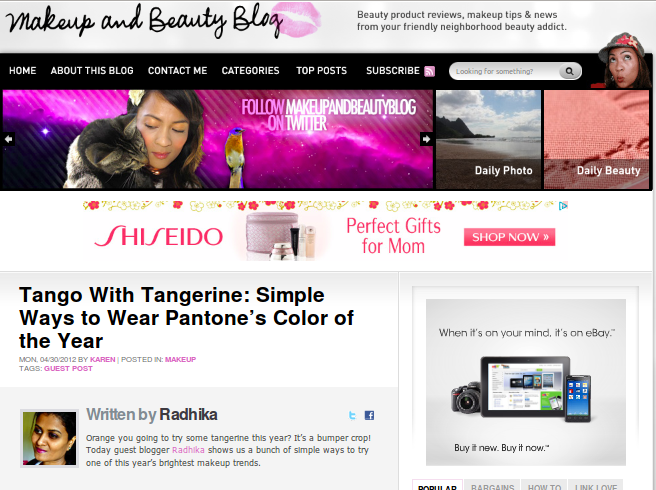 Cheek color shouldn't be limited to the apples (no one blushes only on their cheeks!). I always blend a bit into the hairline, along the jawbone, and on the tip of the nose to create a more natural-looking, all-over hint of color. NARS Liberté blush from the summer 2012 makeup collection. I love the sleek black packaging, and as someone who takes a ton of photos, I love the fact that the rubber-matte finish doesn't reflect light like crazy or turn into a fingerprint magnet at the slightest excuse. The blush pan is compact and comes with a useful mirror. Enough about the packaging - on to the blush itself: Liberté picks it's name from French for freedom. Described by NARS as a versatile burnished apricot, I find this a matte reddish-coral blush. I won't want to call it matte because it doesn't go on dull and lifeless on me, but there really is no shimmer in it that I can detect. I found this quite an easy colour to use - not insanely pigmented that I needed 3 brushes to get it just right. I applied this with my MAC 187, and did a bit of a dab-dab blending and finished with the application. Perhaps because I am darker with some yellow undertones to my skin, I got a controlled application with this blush-brush combination.